Marjorie says "It was meant to be"
WINTER HAVEN, Fla. — Marjorie Zarbaugh's mom always hoped to have a granddaughter one day and a shopping trip in 2011 seems more like an act of serendipity nearly 7 years later when Marjorie received a gift from her mom at their gender reveal party in 2018. Marjorie's mom bought a "First Impressions" dress from Macy's in Winter Haven on September 9, 2011, hoping she would one day give it to a special little girl in her life. She held on to the dress for nearly 7 years, waiting for the exciting news of a grandchild on the way. 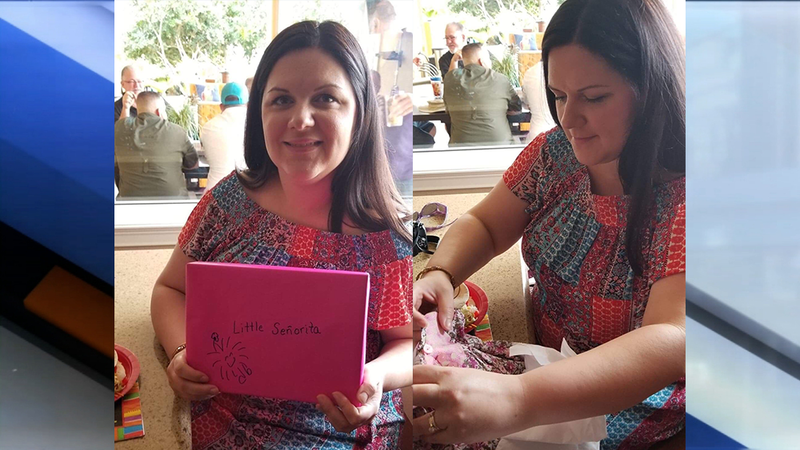 In 2018, she found out that she would be a grandmother and gifted her daughter with the dress at their gender reveal party in May of 2018. Her mom made sure to write a note on the receipt of the dress. It said "Look how long I've had this? :)" and she had circled the date. Marjorie says "I thought it was cool so I kept the tags on it." Marjorie welcomed a baby girl named Madelynn nearly 4 months later. On January 12, 2019, Marjorie was going through baby clothes and found the dress. She went to cut the tags off of the dress when she noticed something really cool. Marjorie's mom had bought the dress on her daughter Madelynn's birthday, seven years prior. Marjorie shared her story on Facebook and said "How do you explain that! Tears, happy tears." Marjorie thinks it was meant to be that she didn't cut the tags and receipt off of the dress when she got it in May. She said "had I done that we would have never known. It was meant to be." Looks like Marjorie's mom knew exactly what she was doing when she picked up a little girl's dress in Macy's, that day in 2011. ABC Action News reporter Andrea Lyon contributed to this story.